That bottle of iconic wine or single-malt Scotch you just picked up likely is authentic, but as with any product of value, knockoffs are a tempting way for fraudsters to make a living—or a killing. With high-end beverages, counterfeits can be tricky to detect, because even product testing isn’t always conclusive. History is rife with tales of con artists who invent fake labels, doctor ordinary wines or spirits, make outrageous claims, and scam those who collect such prizes. In one celebrated instance, a case of Le Montrachet—a famed and very expensive French Chardonnay-based white Burgundy—was sold by a Beverly Hills wine merchant to a Japanese wine collector. On closer inspection, the label listed an appellation that didn’t exist. The collector noticed the error, engaged Los Angeles police, and a settlement was arranged with the seller of the wine (who denied any knowledge of the fraud). Such tales led, many decades ago, to branding corks as a measure against duplication. Today, if you order a bottle of fine Bordeaux while dining out, the waiter can hand you the cork that’s just been removed from the bottle, and you can verify the wine cork bears the same chateau’s name and has the proper vintage burned into it. Labels are easier to counterfeit than are branded corks. Another famous con was the case of self-proclaimed wine expert Rudy Kurniawan, a New York scam artist who made “prestige” wine in his kitchen by blending ordinary wines and using fake labels. He then sold the wine to many international wine collectors. Kurniawan was arrested in 2016, convicted, and is now behind bars. Fraudulent beverages are usually more difficult to detect than hard goods, unless the bottles are clearly the wrong shape or color based on historic records, the labels obviously doctored, or the corks improper in some easy-to-see way. 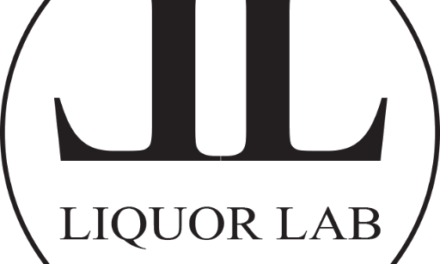 Beyond obvious fakes, detection is usually left to experts, such as the International Federation of Spirits Producers (IFSP), which represents more than two-thirds of internationally recognized spirits brands. IFSP works with international law enforcement to provide training, information, and technical expertise to distinguish and protect genuine products. According to IFSP, spirits companies lose more than $1 billion per year to counterfeit alcohol, which translates to heavy losses in tax revenue as well. Iconic wine and high-end spirits are easy targets for counterfeiting, since so few people know exactly what Dom Perignon, Chateau Petrus, DRC Le Montrachet, or Martell Cordon Bleu XO Cognac are supposed to taste like. However, this isn’t just about ancient vintages and rare producers anymore. A July 2017 article in Forbes identified China as a prime target for counterfeit (and contraband) wine and spirits—both as an importer and as a producer. The article also referenced Australian wine critic Jeremy Oliver’s estimate that 50 percent of wines retailing for $35 or more in China are likely fake. (Every year, Oliver’s Australian Wine Annual is translated into Mandarin and widely sold throughout China.) Empty bottles of coveted brands command top dollar in the region, just perfect for refilling and resale. Macallan Highland Scotch Whisky, began using Izon security labels to seal capsules to its bottles in response to reports of refilled bottles appearing on retail shelves globally. A large-scale fake whisky bottling operation was discovered in London last year, and the Scotch Whisky Association reported in 2017 that it was pursuing close to 70 illegal actions globally to prevent the sale of inauthentic products. In Russia, nearly 30 people died last year after consuming methanol sold as a branded whisky. In response to these and other threats, a small-but-growing industry has developed among some high-tech companies to certify the authenticity of bottles that may be targets of counterfeiters. Most new developments focus on technology and packaging (bottles, labels, capsules) and are portable and fast, so samples no longer have to be sent to an offsite laboratory for lengthy analysis. The RFID, or radio frequency identification chip, is well known in the wine industry. It was initially used by some large wineries in California nearly 20 years ago, mainly for inventory control. Recently, RFID technology has been adapted for authentication purposes in certain applications. 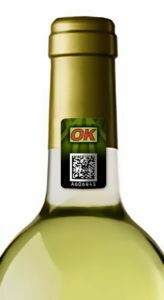 Today, an Italian company, Lab-ID, has a system that embeds RFID chips in artificial corks, giving wine buyers “greater assurance of the quality and provenance of each bottle of wine.” Wine buyers and industry persons can “read” the data on the tag. Bottles without the tag, or with improper information, may indicate something is amiss. De La Rue offers unique serialized 2D barcodes combined with Izon technology. 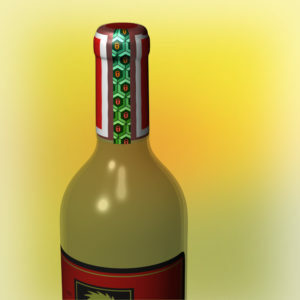 A newer device, marketed by De La Rue Authentication Solutions of the United Kingdom, affixes a unique three-dimensional holographic image to bottles (created using proprietary photopolymer technology). R.J. Dlugopolski, a U.S.-based executive with De La Rue, says the IZON technology, which the company bought in 2017 from DuPont Authentication, can be used either with existing labels and capsules or integrated into a shrink sleeve. Either way, IZON offers simple and intuitive visual verification. The company also provides 2D security technology in the form of a label containing a unique printed variable barcode that’s scannable using any smartphone. If scanned with a free app (such as i-Nigma or many other barcode readers), it provides verification of product, educates consumer about what to look for on the security label, and provides links to other product info that the brand owner would like to share. In 2010, The Edrington Group, makers of Macallan Highland Scotch Whisky, began using IZON security labels to seal capsules to its bottles in response to reports of refilled bottles appearing on retail shelves globally. 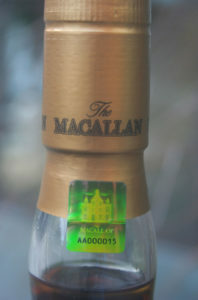 Since adoption of IZON 3D Hologram technology in 2010, in combination with other measures, it’s identified no significant instances of counterfeit or refilling of Macallan Whisky. It would seem that the De La Rue label has severely interfered with the counterfeiter’s activity. The IZON label also helps customers readily identify that the Macallan Brand they’re buying is authentic. The company applies the label to the glass and the cap, so if it was removed and the bottle refilled, the IZON label would be destroyed. Consumers can clearly see if the label is tampered with, which helps build customer loyalty and trust in the brand. 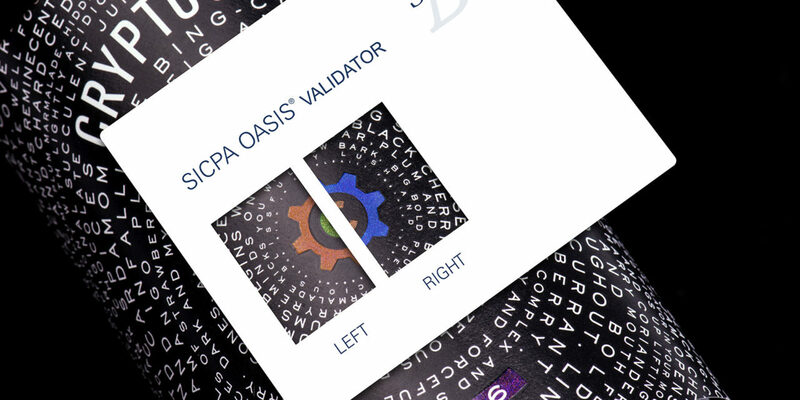 SICPA offers multi-layered security solutions, including color-changing inks, polarized light effects, and tamper-evident capsules. SICPA, one of the world’s largest and most sophisticated ink companies, markets specialty inks used on many of the world’s banknotes, official documents, and branded products. It’s now using these same materials to secure collectible alcohol. The Swiss-based company offers multi-layered security solutions, including color-changing inks, polarized light effects, and tamper-evident capsules. Capsules are embedded with sensors or embossed with UV-sensitive inks, invisible to the naked eye, meaning the authenticity of a bottle can be quickly determined using a small handheld device or a smartphone. 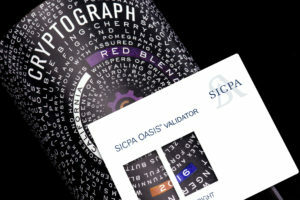 “It’s SICPA’s goal to offer solutions that protect wine and spirits while adding to the appeal of a bottle design with flexible, cost-effective integration of security features into label, capsule, and closure designs,” says SICPA Product Security Vice President Rich Einhorn. The growth of anti-counterfeit technologies being developed for the alcohol beverage industry suggests the problem may be more widespread than is readily apparent. SICPA security solutions also enable field auditing ranging from broad-based international investigations to pilot programs in select markets. Lafitte Cork and Capsule worked with SICPA to develop covert and semi-covert authentication technologies for its capsules. Because of the sensitive nature of such crimes, where reputations and fortunes are both at stake, victims (producers, buyers, and even retailers) often request anonymity—or are reluctant to report they’ve been duped. And the websites and representatives for various technological solutions often decline to name clients that are using these products. But at trade shows where the technologies have been displayed, “we’re getting more inquiries than ever, with brand owners especially interested in a high-security label incorporating 2D verification codes as well,” says Dlugopolski. All interviewed for this story concede that these features do add to the cost of packaging. But depending on the product, market, and intended consumer, it may be an investment worth making. 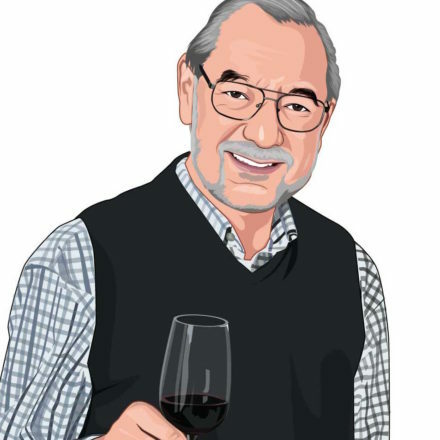 Dan Berger began writing about wine 40 years ago while with The Associated Press. 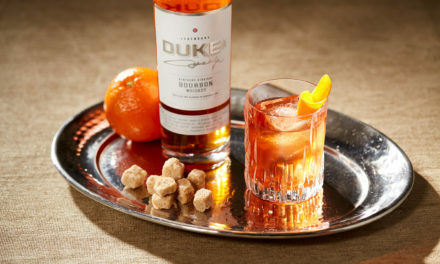 He was nationally syndicated in 1979, and continues to write for newspapers and magazines around the world about food, wine, beer, and spirits. His newsletter Vintage Experiences has been published 48 times a year since 1996.